Natuurkundige verlustigingen, behelzende microscopise waarneemingen van in- en uitlandse water- en land- dieren. door Martinus Slabber ... - J. Bosch, Haarlem. 168 pages, 18 plates. Published between 1769 and 1778 in 18 instalments. The complete text of Natuurkundige verlustigingen can be read, searched through and downloaded at (BHL) or (Google). Very sharp pictures with some indications about the species are provided by the Rijksmuseum in Amsterdam. 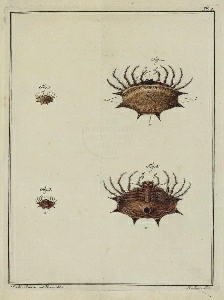 Also partly published in German in a translation by Philipp Ludwig Statius Müller in 1775 with the title Physicalische Belustigungen oder Mikroscopische Wahrnehmungen in- und auslândischer Wasser- und Landthierchen. Winterschmidt, Nürnberg. 25 pages, 6 plates. And complete, after some individual instalments in between, by the same translator in 1781: Physikalische Belustigungen oder Mikroskopische Wahrnehmungen von drey und vierzig in- und auslândischen Wasser- und Landthierchen. Winterschmidt, Nürnberg. 99 pages, 18 plates. The complete German 1781 version from University Sachsen-Anhalt is available here. The same version with the 1781 title page missing is provided by Stasbourg University. One source of identification is an article by R.T. Maitland which came out a hunderd year after the books of Baster and Slabber were published (1876). About another hundred years later Maitlands list was updated by the malacologist Tera van Benthem Jutting (1970) with the help of various specialists. Literature was studied for recent identifications. Where no recent data were found Godfried van Moorsel and I checked ourselves and asked specialists to help identify Slabbers species. Specialists who helped identifying species are named at the appropriate places.